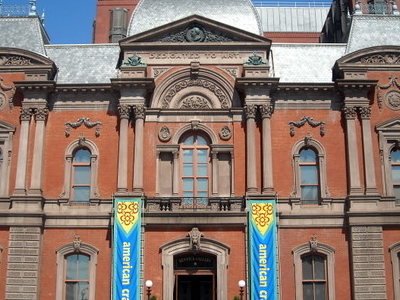 The Renwick Gallery building was originally built to be Washington, D.C.'s first art museum and to house William Wilson Corcoran's collection of American and European art. The building was designed by James Renwick, Jr. and finally completed in 1874. It is located at 1661 Pennsylvania Avenue NW. Renwick designed it after the Louvre's Tuileries addition. At the time of its construction, it was known as "the American Louvre". The building was near completion when the Civil War broke out and was seized by the U.S. Army in August 1861 as a temporary military warehouse for the records and uniforms for the Quarter Master General's Corps. In 1864, General Montgomery C. Meigs converted the building into his headquarters office. On May 10, 1869, the building was returned to Corcoran, and, on January 19, 1874, the Corcoran Gallery of Art opened to the public. The gallery quickly outgrew the space and relocated to a new building nearby in 1897. Starting in 1899, the building housed the federal Court of Claims. By the 1950s, in need of more space, the Court of Claims proposed to demolish the building, however, it was saved from demolition by First Lady Jacqueline Kennedy in 1963. In 1965, President Lyndon B. Johnson and Secretary of the Smithsonian S. Dillon Ripley, proposed that the building be turned over to the Smithsonian. Here's the our members favorite photos of "Galleries in Washington". 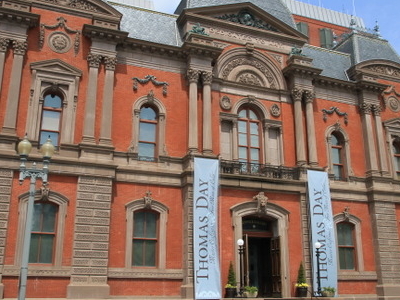 Upload your photo of Renwick Gallery!